If you were a young boy in the late 1970s and early 1980s, chances are you were quite familiar with the crown logo of Imperial Toys. From the admittedly limited perspective as a 6-year-old boy, Imperial was known for one thing: rubber dinosaurs. Imperial specialized in those solid rubber dinosaurs you'd find in convenience stores, pharmacies, and the metal floor bins of toy stores like Child World. They usually sold for about a buck. Those dinosaurs were tough bastards; you could throw them against the wall all day long and they wouldn't get a scratch. The sculpts and paint applications were crude even by contemporary standards and there was nary a point of articulation to be found on them, but when I was a kid that hardly mattered. 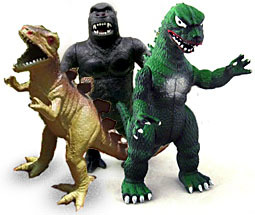 The rubbery feel of the dinosaurs' skin, coupled with their Godzilla-like indestructibility, made them the preeminent dinosaur toys of my youth. A lot of the Imperial dinosaurs were of questionable paleontological validity. Tyrannosaurs with stegosaur-like plates and apatosaurs (which we called brontosaurs in my day) with pointy teeth were common. My particular favorites were a small yellow tyrannosaur (now residing in my Toy Shrine), a duck-billed dinosaur thing, and a black creature that was sort of a cross between a frog and an allosaur who I called "Bumpy." In addition to dinosaurs, Imperial produced a whole assortment of creepy-crawlies - giant spiders, sharks, squid, gorillas, and whatnot. But in the mid-1980s, Imperial attempted to branch out their rubber monster toy line to licensed properties. I distinctly remember coming home to my parents' apartment in South Weymouth to find my mother and my aunt talking in the kitchen, an Imperial Godzilla toy on the table between them. I was both pleased (a new toy!) and a bit disappointed; Imperial's figure looked a little shoddy next to the hyper-realistic Bandai Godzilla figures my parents had generously bought me from the famous Mr. Big's Toyland in Waltham (to this day, I can't hear the name Waltham without thinking of Mr. Big's Toyland, which has been gone for nearly 20 years). Even more intriguing, however, was the fact that Imperial's Godzilla could move at the arms, legs and tail. This was a whole new level of innovation for Imperial's dinosaur army. At some point as a kid, I snagged Frankenstein's Monster. I think I also had Dracula at one point. 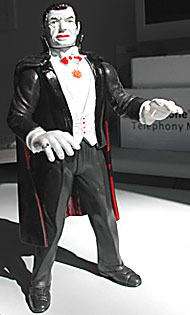 Frankie usually served as an antagonist for my various other action figures (just as the dinosaurs did for He-Man). Unlike Godzilla and King Kong, Frankie and Drac have a somewhat decent sculpt and paint application. Frank bears a passing resemblance to Boris Karloff, while Dracula is a reasonable approximation of Bela Lugosi. 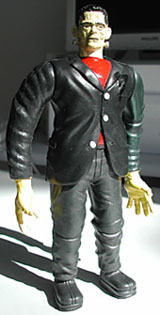 Both figures moved at the shoulders and neck. At the time, these were pretty good as far as Universal Monster toys went, and in my opinion, for their size, the best thing until Sideshow's action figures a decade later.